Mix all the ingredients together and stir in 350 gram water. Allow the batter to rise for one hour. Use two tablespoons or an ice-scoop spoon to make balls out of the batter and fry those 7 minutes at 160 degrees Celsius. Turn them halfway if necessary. Serve with icing sugar. Drill the core out of the apples and cut them in four slices. Mix the sugar with the cinnamon and sprinkle over the apples. Leave the half an hour. Make batter out of flour, milk and egg. 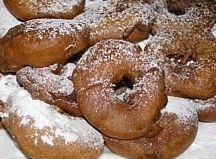 Dip the apple slices in the batter and deep fry them at 180 degrees Celsius. 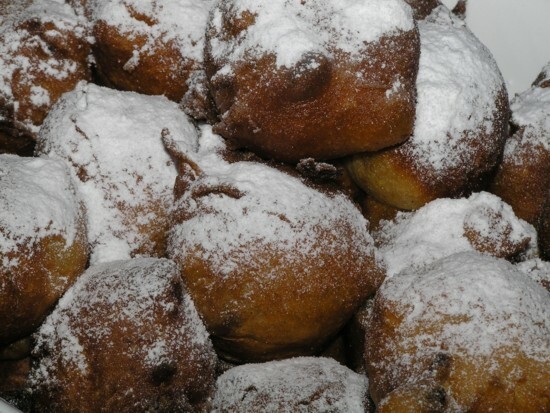 Finding an English translation for "Oliebollen" (smoutebollen in Belgium) was hard, the best one that came up was "Dutch doughnut", according to Wikipedia. To me, however, a doughnut is a not the same thing and has a different shape, the dough is different and it has a hole in the middle. 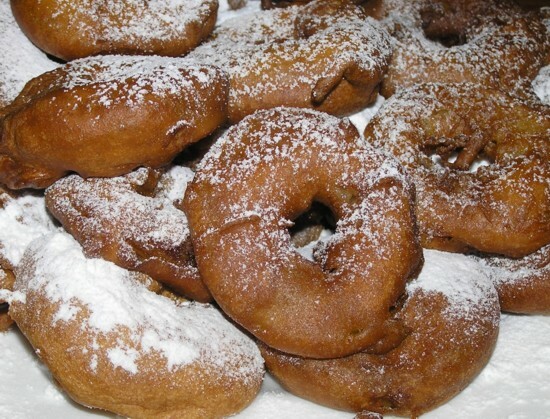 Luckily, one of my readers indeed confirmed the demand for an oliebol to have a hole to be a doughnut, and that the right name should be fritters. The Dutch eat their oliebollen and appelflappen on "Oudjaarsavond", New Year's Eve. When I was small, my grandfather used to bake literally buckets full of them, and I remember the house smelling of sweet baking and us eating them the whole evening and having our breakfast on the first of January with the leftovers. Nowadays, we bake only 20 or so, as it is not considered healthy any to eat so much deep fried food. On Worldcook's New Year page you will find New Year recipes from all over the world.